This is part two of the 20 Best Playgrounds in Maryland series. These playgrounds will delight and amaze your kids and you all will have so much fun playing on them! Plenty of space to run around. Treasure hunts. Logs to climb through. Swings. Massive slides. Interesting climbing and balancing features. There are just some playgrounds that are a destination in and of themselves. The playgrounds on this list definitely fall into that category. 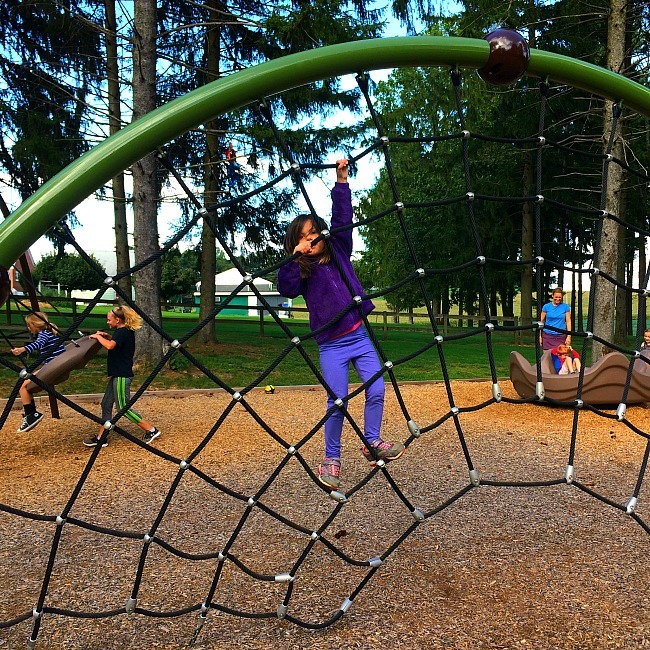 My daughter and I have played on over 50 playgrounds in Maryland and have decided that these playgrounds are the absolute best! Many of them are playgrounds you could almost spend all day exploring. Some are in parks that are day trips in and of themselves. All of them are oodles of fun. These playgrounds are not your average neighborhood playground. Nope, they are really quite remarkable. 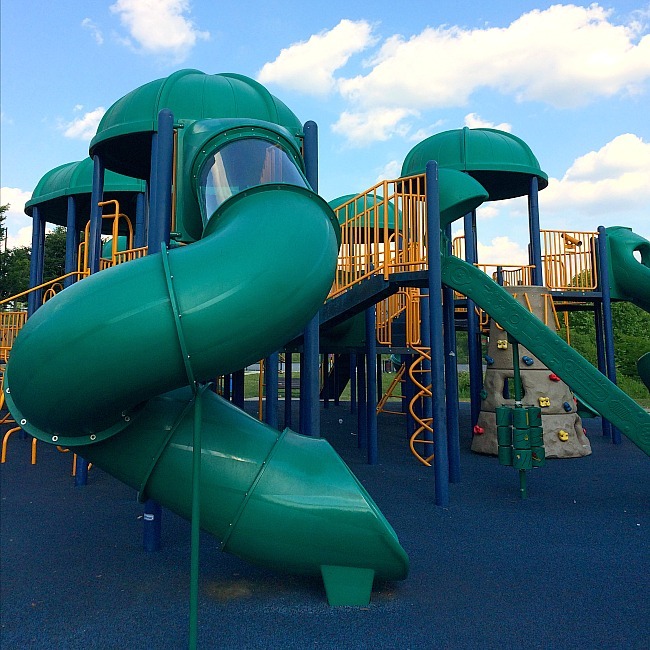 Part One encompasses the top 10 playgrounds in Maryland. 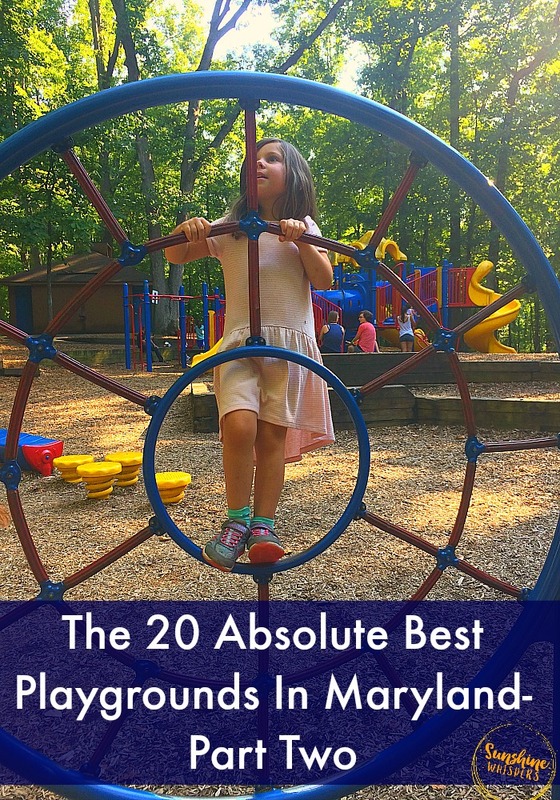 Part Two (this post) rounds out those top 10 with 10 more playgrounds that are amazingly fun and will definitely make you a superhero with your kids! Let’s dig in! 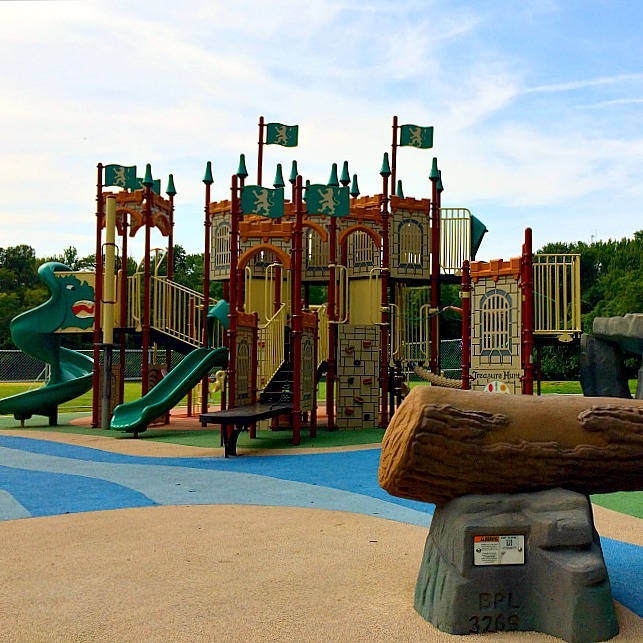 Here is part two of the 20 Absolutely Best Playgrounds in Maryland list! It was a real struggle to decide on #20 for this list. Why? Because there are so many amazing playgrounds in Maryland! I chose this playground though for a variety of reasons. The playground is really fun for all ages and ability types. There are loads of climbing opportunities and a few slides. There are lower to the ground features for little kids, like a ‘hollowed out log’ they can climb though. Around the outer perimeter of the playground kids can bang away in the sound garden, and there is a pretty cool feature that is basically a large see saw car. I believe it is officially called an Aero Glider. The Aero Glider is actually wheelchair accessible (which is probably why it is large) but kids of all ages and ability types loved loading up and riding away as willing parents pushed them up and down. The playground is in a shaded area and there is plenty of parking nearby. This park is open year-round from 9AM to sunset. There is a small admission charge ranges from $2-$4 per car and $3-$5 per person depending on time of year, weekend or weekday, and in or out of state residency. U.S. active duty military or veterans are free of charge. There are public restroom facilities near the playground. Don’t leave the playground too quickly. There are a few short hikes in this area of the park that look very doable for young legs. This part of Patapsco State Park is literally off Rt. 40 between Catonsville and Ellicott City. You could swing by here on the way to or from Old Ellicott City Main Street. The Robinson Nature Center is also only 3 miles from this area of Patapsco Valley State Park. You can read my review of Robinson Nature Center here. Centennial Park is such a fantastic place to spend the day. There are actually a few playgrounds located throughout the park. However, the South Playground (located at the main entrance off Rt. 108) is really quite lovely. It is sprawling, with lots of places for kids to climb, run, and slide. If you have smaller kids, especially kids under 2 years old, you may want to steer clear of this playground in favor of one of the other three playgrounds sprinkled throughout the park. This playground does tend to be VERY busy and incidentally, the other three playgrounds tend to be much more low key. But, the reason the South Playground is so busy is because it is so much fun! This park is open year-round from 7AM to dusk (unless different hours are posted). This is a FREE park, so no admittance charge. Less than a mile away from the main entrance of Centennial Park is Clark’s Elioak Farm, which is a super fun place for kids. Clark’s Elioak Farm is essentially a petting farm (goats, cows, chickens, bunnies, horses, etc…) but they also offer a cow train, hayrides, pony rides, tons of playground equipment in their own right, special event days, AND all of the nostalgic nursery rhyme and Disney set/landmark pieces from the old Enchanted Forest. I wrote a review of Clark’s Elioak Farm here. Do your kids dream of what life would be like if they lived in a castle? 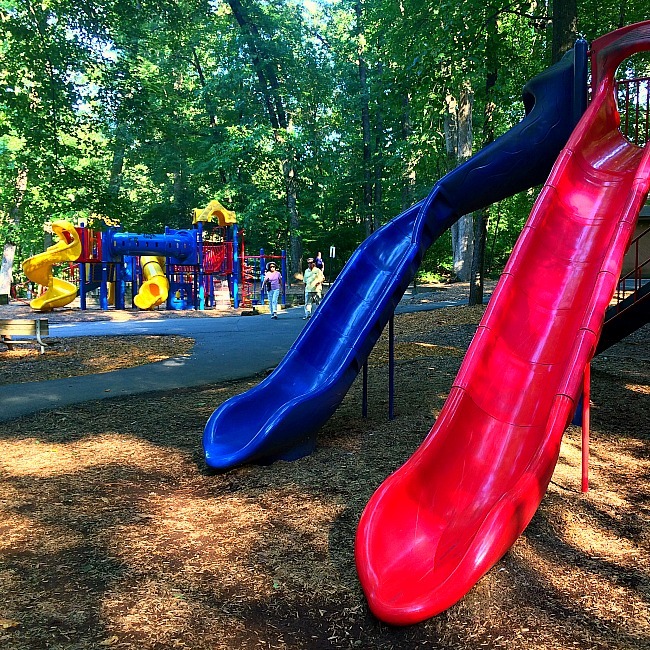 If so, you have got to check out the King and Queen Playground, located at the Cheverly Euclid Street Neighborhood Park in Prince Georges County. Yep, this is another one of the PG County Imagination Playgrounds and it is awesome. Your kids can walk across the moat or scale the walls. They can climb to the top and be the look out or slide down the dragon slide. There is a separate tot lot for younger kids next to the main playground, as well as swings (2 regular, 1 baby, 1 accessible), and separate climbing structures like a log and a few boulders. I could not find hours of operation for this park so I am going out on a limb to say it is likely open dawn to dusk. This is a FREE park, so no admittance charge. There are no public restrooms at the playground but there is a large port-a-potty. Additionally, there is little to no shade (so a hot sunny day might not be the best choice for this playground) but there are water fountains! 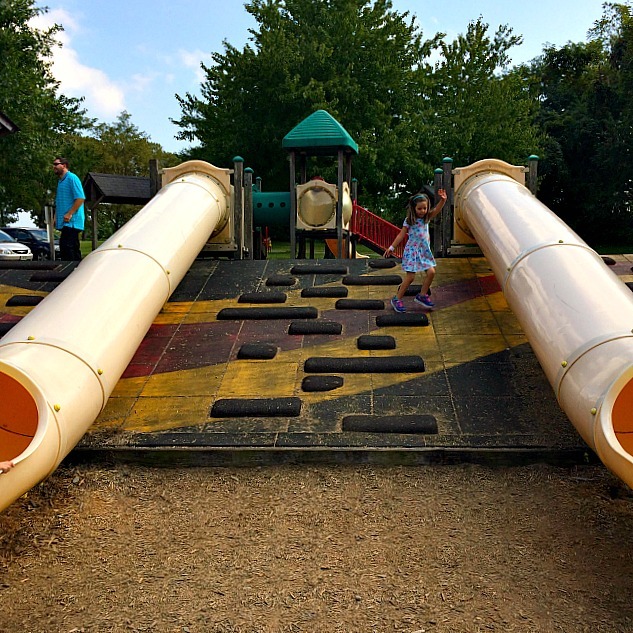 This park and playground are tucked inside a sleepy neighborhood on the edge of the Maryland-Washington D.C. border. However, two great nature parks are within 10-15 minutes of the playground. The U.S. National Arboretum is only 3 1/2 miles away. The Arboretum is very kid friendly, especially in spring and early summer as the trees and flowers are in bloom. Kids will totally enjoy running up to the famous capitol columns, and the bonsai trees are always great to walk through as well. are a fantastic National Park to visit in the summer months. This park, only 2 1/2 miles from the King & Queen playground, is the home to giant lotus blossoms and water lilies throughout the summer. So, your kids can pretend to be royalty and then see flowers as big as their heads.. all in the same day! You know a playground is going to be oodles of fun when it was designed by kids! Yep, this creative playground was designed in part by area kids so there are a ton of fun features. My daughter loved the tire swing, all the slides, the see saw, and the sandbox. There are towers, tunnels, and bridges that would be great for a game of tag or hide and go seek! This park is fully enclosed and there are great play features for older kids and really young kids too! For parents there are benches around the fence line, some shaded, some not. There are public restrooms at the playground, plenty of parking, and plenty of shade. Less than 10 minutes away from the Lyn Stacie Getz Creative Playground, you can satisfy your sweet tooth with a scoop of delicious ice cream from Broom’s Bloom Creamery. We almost missed this lovely playground. While eating ice cream at Hoffman’s Dairy, the family next to us kept talking about their favorite playground that was just 10 minutes away! I am soooo glad we ran into them! The Christmas Tree Park Playground is sprawling. It is hard to capture just how big it is because it includes at least four main playground areas plus swings! The newest area is where we spent the most time. Here there are ziplines, chair ziplines, balance beams, multiple versions of roundabouts and see saws, climbing structures, a sound garden, and more! In the more traditional playground areas there are also plenty of slides. The playground and park are largely shaded (hence the name, Christmas Tree Park) and there is tons of space to run around. Local youth sports teams will likely be playing on the soccer or baseballs fields, and there is even a sand volleyball court (which I suppose doubles as a giant sand box). There are public restrooms at the playground, plenty of parking, and plenty of shade. The entire park is covered with shade trees! You could easily make a great day trip of spending the morning picking fruit at Baugher’s Orchard (click here to read my review of apple picking there) and then burning some energy at this playground in the afternoon. In August and September, you could also make a pit stop at The Sunflower Garden to pick your own flowers and get some amazingly cute photo ops too! I don’t know why we love tire playgrounds so much, but we do. Maybe it is because they just seem so… scrappy. (ha. pun intended). All three of these tire playgrounds are included in this entry because, as best I can tell, they are essentially the same playground in four different places. We have not been to all four (yet), but we have played on the one at Calvert Cliffs State Park and it is ridiculously fun! 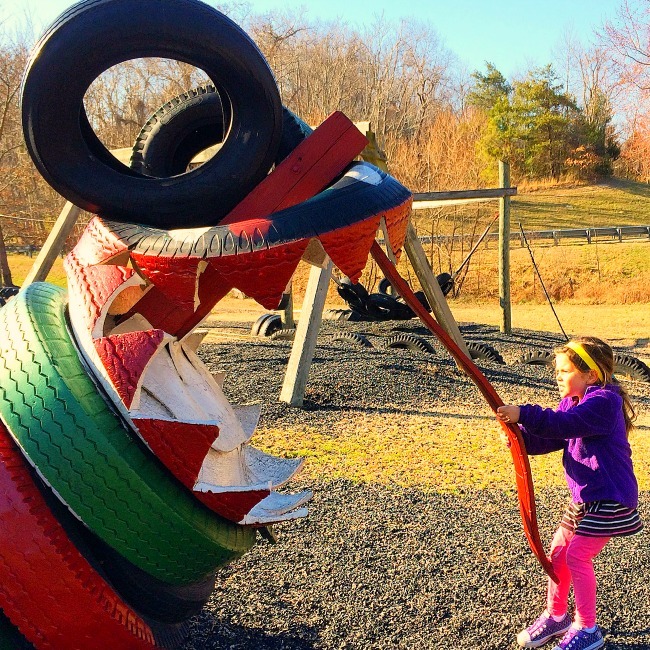 Kids can climb on the spine of a fire breathing dragon and then pull its tongue out. Or, maybe pretend they are swashbuckling pirates and sail the open seas on board the huge pirate ship made out of tires. There are tire swings, tire spider web bouncy play features, tires towers, and tires, tires everywhere! Other features you might find include really fast slides, sandboxes, and other play features unique to each park. These are all Maryland State Parks so they are open year-round from 9AM to sunset. There is a small admission charge ranges from $2-$4 per car and $3-$5 per person depending on time of year, weekend or weekday, and in or out of state residency. U.S. active duty military or veterans are free of charge. There are public restroom facilities in all of these parks, but I cannot attest to their proximity to the playgrounds (when I find out for sure I will update this part of the post). For Calvert Cliffs: Well, there is shark tooth hunting at Calvert Cliffs. However, the hike back there is pretty far. Good thing another beach, Flag Ponds Nature Park, is only a short drive away. You can read my review here. Also, you could easily spend half the day at the nearby Annmarie Sculpture Garden (it is super kid friendly). You can read my review of that awesome place here. Finally, the Calvert Marine Museum is super fun for kids and also a short drive away. Combine any of these options for a great day trip! For Seneca Creek State Park: You are in luck. In addition to all the trails you can rent a boat and paddle on Clopper Lake. 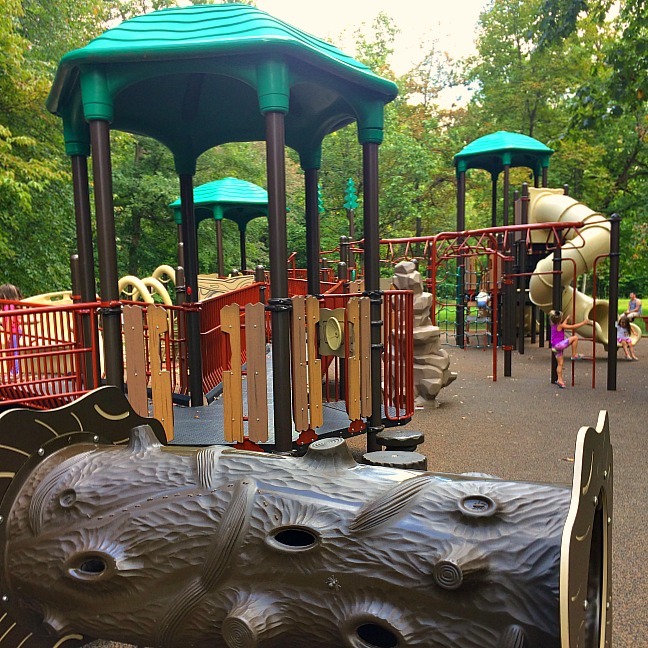 Within 15 minutes of this park, you can splash at either Bohrer Splash Park or the South Germantown Splash Park (read my review here). Also, Butler’s Orchard is about 15 minutes away, so you could spend part of the day there and then wind down with some additional play time at the Tire Playground. For Tuckahoe State Park: This park is quieter than most but that is its appeal. You can fish, kayak, and there are some nice hiking trails. If you want another place to round out your day trip, stop by the Chesapeake Maritime Museum on your way back across the Bay Bridge. For Gunpowder Fall State Park: This lovely state park is a destination in an of itself. Get there early on summer weekend days in order to get access to their very kid-friendly beach. The playground is located in the same part of the park as the beach. After you day playing in the park, make the short (15 minutes) drive to the Prigel Family Creamery for some delicious ice cream, one of the stops on the Maryland Ice Cream Trail! 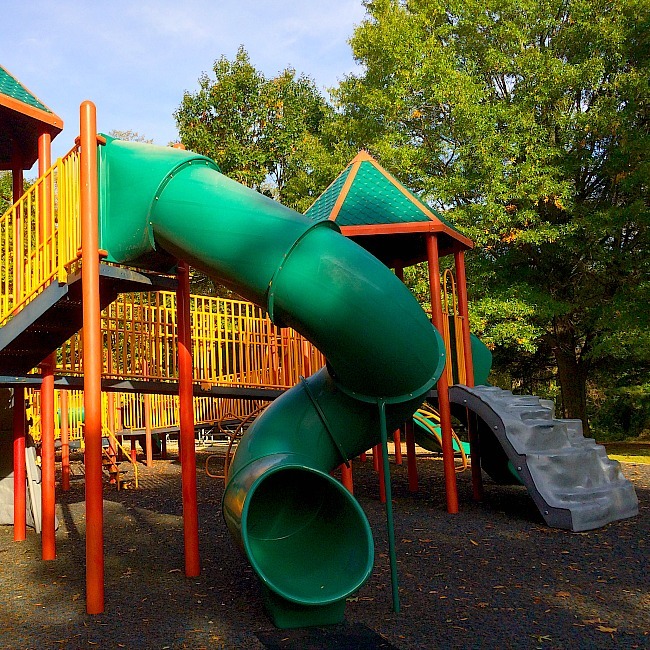 The Kinder Farm Park Playground is a little older than the other playgrounds on this list, but that does not mean it isn’t oodles of fun for kids! Like a few other ‘best playgrounds,’ the playground here is sprawling. It actually encompasses three levels. Our favorite feature was probably these double barrel slides and stepping stones. Up top is a tot lot with fun animals to climb on. 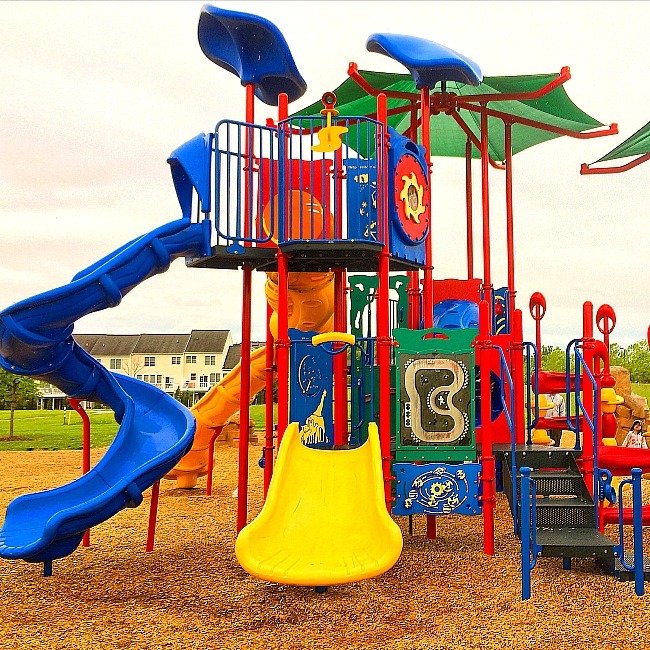 The middle and bottom sections contain numerous play structures where kids can balance, climb, slide, and swing. Yes, there are swings at this playground too! Kinder Farm Park is open 7AM-830PM (or dusk) every day but Tuesday (closed on Tuesday). The parking fee for day use is $6/vehicle but veterans and active duty military members are FREE. There are public restrooms near the playground and plenty of parking. There are ample shady areas too! The best nearby places for kid-friendly fun are actually both drop in art places! Artsy Partsy and Pic ‘N Paint Pottery are both less than 15 minutes away from Kinder Farm Park. Artsy Partsy has Friday Night Family Paint Nights every Friday night and Pic ‘N Paint Pottery has drop in pottery painting pretty much any time they are open. Both places are very young kid friendly too! This playground almost made the top ten list. It is massive and fun not just for older kids but also smaller kids. In addition to this huge play structure there is a tot lot (for younger kids) with ride-on’s, swings, and a large sandbox. The huge play structure pictured below is actually three play structures connected to each other. There are two massive parts with slides, tunnels, and places to climb. In between is one of those large climbing web knots that a few other area playgrounds also have. This playground also has some unique features that are worth mentioning like a balance skateboard contraption, climbing boulders, a balancing structure that seems pretty unique and then this: NEOS, part game, part sport. NEOS is an electronic game/sport which seems a lot like a giant game of Simon. You can choose from 9 games, up to 2 players at a time, and various levels of play. Each game uses sound and/or light to get game players moving and thinking. It is a pretty novel concept that I had never seen before. I bet this playground is super busy on nice days! This park is pretty much open from dawn to dusk (there is not a fence). It is located behind a Safeway grocery store and is FREE. There are public restrooms near the playground and plenty of parking. There is a shaded pavilion but the playground itself is not very shaded… so bring sunscreen. Well, you are about 5 minutes from the Glenn Dale Splash Park, so you could play hard on the playground and cool off at the splash park. Or, you could spend a few hours at the NASA Goddard Visitor Center, only about 10 minutes away, and play afterwards. If you want to satisfy your sweet tooth, there are plenty of great options (Rita’s, Cold Stone). My picks would either with the Simple Pleasures Ice Cafe or the Heaven Sent Cupcakery. When you think of massive playgrounds, the Long Gate Playground at Meadowbrook Park is hard to beat. There are two main playground areas, a playground for younger kids and this massive playground (which is also fully accessible). Between the two of them we counted 14 (!!!!) slides of varying sizes, speeds, etc… plus lots of places to climb, tunnels to crawl through, and balance features like stepping stones. Much like Centennial Park, this playground can be overwhelming for young kids. It is nice that there is a smaller version of the playground, but I have to tell ya– your toddler will see this huge playground and they will absolutely want to check it out. There are plenty of toddler-safe features on the big playground too, but there are also quite a few harrowing drops. So, just keep an eagle eye out. This park is pretty much open from dawn to dusk (there is not really a fence). There are public restrooms near the playground and plenty of parking. There is some shade but most of the playground is not very shaded… so bring sunscreen. This playground is smack dab in the middle of suburbia. It is situated right off of Rte. 100 and very close to Rte. 29 and I-95. So, if you are road tripping and need a quick diversion, this would be ideal. It is called the Long Gate Playground because Long Gate Shopping Center is less than 1/2 mile away. This shopping center has pretty much anything you would want– Kohl’s, Target, Michaels, Barnes and Noble, and a ton of restaurants– suburbia. If you are looking for something more recreational or exotic, The Duchess Variety Store is well known for its ice cream and milkshakes, and Old Ellicott City Main Street is a short drive from the park as well. We visited this lovely playground on a VERY hot August day. I didn’t think we would last more than 20 minutes, but to my surprise the canopy of tall trees provided a refreshing cover of shade that almost made us forget how hot and humid it was outside. Like a number of other playgrounds on this list, the Cabin John Regional Park Playground is pretty fantastic… and large. There are probably a dozen play areas within the boundaries of this playground, There is a traditional looking playground (see below), as well as this cool 3-pronged slide (also see below). There are swings, climbing boulders, other neat climbing and balance apparatus, and plenty of play structures for younger kids, including a wooden train. As we were leaving we saw kids climbing up and jumping down a huge hill of saw dust. I am not sure that was meant to be part of the playground or not… but it sure looked like a lot of fun! Cabin John Regional Park is open year round sunrise to sunset. Access to the playground is FREE. There are public restrooms near the playground and plenty of parking. If you ever take day trips to Northern Virginia from Maryland you will want to keep this information handy. Cabin John Regional Park is just off the Beltway in Bethesda, before the I-270 spur. That means if you are stuck in horrible traffic and your kids need a break, you could plan a stop here until some of the traffic dies down. Trust me… you want to know where this park is! Regardless of the DC traffic situation, there are many other things to get excited about. The playground and park are free but for a small fee ($2.50 per ride) your kids can ride on an adorable miniature train. Also, don’t forget to check out the Locust Grove Nature Center, also located at the park. Nearby, your best bet is to spend some time at Glen Echo Park. Plan to take in a children’s show at either the Adventure Theatre or Puppet Company, ride the carousel (in season), and stop by the small aquarium on site. Phew! There are so many awesome playgrounds in Maryland. Which one will you try first? 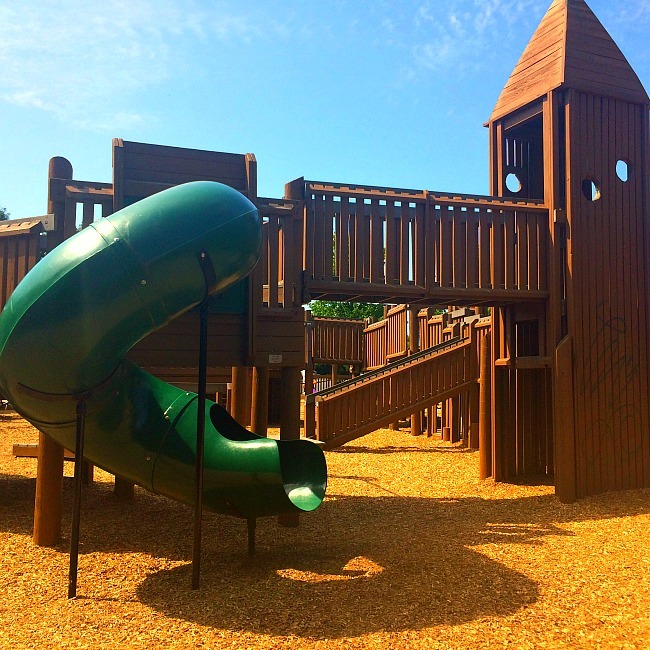 Click here to see the top 10 Absolute Best Playgrounds in Maryland!